Several years ago when my daughter, who at that time was only around 9 or 10 years old and a Junior Girl Scout, attended a Babysitting Clinic taught by one of our Cadette Girl Scouts, she had no idea that she was planting a seed that would grow into a family business. Two years later in about February of 2001 while working on a "Career Study" as a Cadette Girl Scout, she earned an Interest Project Patch called "YOUR OWN BUSINESS". Some of the requirments to earn this "IPP" were for her to brainstorm an advertising campaign for an imaginary or real product or business, develop and implement a plan to turn a hobby into a business adventure, create a project to help parents, arrange for "women in business" to join her troop meeting and be interviewed as well as create brochures and posters for her business. Being just old enough to start babysitting and remembering how much fun she had with the babysitting clinic she decided to start a babysitting business just for the summer. She worked and researched for several months before everything was set for her business debute in June of 2001. When making the brochures and posters she realized her business needed a name. It was at this point she decided to bring her mom, into the picture. She came up with the idea that "Mom could help her babysit in their home during the week and she could babysit outside the home on weekends." Mom thought that would be a good idea and the business of "MoM & Me DaY CaRe" was born. Once things got rolling and word spread of the new babysitting service it grew into something bigger than "MoM or Me" had ever expected. In the past several years MoM has more or less taken over the week day portion of the business that was suppose to be just a summer Girl Scout project. Jayde still babysits on the weekends but with her busy schedule and extra curicular activites she doesn't have time to handle this fulltime business she created on her own. In January of 2004 "MoM & Me DaY CaRe" AKA Jamie Paul's Day Care Home, became an Illinois State Licensed In-Home Day Care which provides age appropriate activities, State Approved meals and Financial Aide to qualifying families. When asked about her family business MoM replied, "This business is completely family run. Everyone in our immediate family has a part in keeping it running smoothly as well as my mother, who is our assistant". MoM also added, "I am very proud of my daughter! I thank God every day for such a wonderful gift, without her ambition and creative ideas, "MoM & Me DaY CaRe" would not be such a successful business today! Everyone should be so lucky to have someone as special as Jayde in their lives. Our society today would be a much better place if there were more teens as selfless, loving and giving as my Jayde." I am a Christian wife & mother of three children ages from 21 to 29 yrs. We are also the Legal guardians of a family of six siblings ages 9 to 16. I have a degree in Child Care Managment from International Corraspondance Schools as well as an Associates Degree in Christian Studies from The Sure Foundation Theological Institute. I (as well as my entire family) are members of the New Boston Community House of Prayer ~ Formerly known as The New Boston Assembly of God Church where I hope to be in charge of the Youth Program there someday. I was a Girl Scout Leader for 22 years (1983-2005). I am REQUIRED to have at least 15 Hours of training per year so I will take part in additional seminars and classes relating to the field of child development as they become available to me. All SUBS (and most assistants) are trained in both 1st Aide & CPR. They will also take part in seminars and classes relating to the field of Child Care/Child Development. All subs/assistants have had a full background check as well as fingerprinting (for 18 years old & older) and physicals for the safety of your children. This Daycare business is a result of a Girl Scout project I did (See article at left) several years ago. I am the "Me" half of MoM & Me DaYCaRe, but I am no longer my Mom's business partner. I became Mrs. Jayde Willits in 2014 and gave up helping her run the business to pursue my own career and take care of my family. In 2018 I became a Licensed Massage Therepist at The Upper Cut in Aledo. Other than dad our only other full time assistants right now are mom & my two "step sisters" Destini and Sereniti and my "step brother" Zane. Sometimes my cousin Morgan Timmerman still fills in and helps out when needed. Our family is VERY good with children. (By Illinois State Law/DCFS Rules) Morgan will not be left alone with the children until she turns 18. For now she and Destini are merely here to assist us, and/or another adult substitute. 2011 brought MANY new changes to our house, including a whole new look for the daycare. The remodel for the most part is done......other than the basement. But we do not use it for daycare so we can take our time with it. Some day I hope to have another full bath, 2 bedrooms and a Man Cave in the basement. 2012 brought even more CHANGES to our family, so in 2013 we began to remodel. We put on an addition to the back of the house to make room for our growing family. It's still a work in progress but I still dream of finishing it someday. YOUR CHILDREN..... can not only be a tough decision it can sometimes be pretty scarey in todays world. Well let me put your worries to rest! Then in 2000 our daughter completed a Girl Scout project where she had to invent a business that would help a working mother thus "MoM & Me DaYCaRe" was born. She started advertising and we began to get clients. When summer was over and time for her to return to school I took over the business and as it grew we decided to become an Illinois State Licensed Daycare in 2004. What started out as a simple Girl Scout project has now grown into a Family business (see above News Paper article). So our first mission is to keep our family together, working side by side, helping, supporting & loving each other. We are a close Christian family, full of love, laughter and fun. 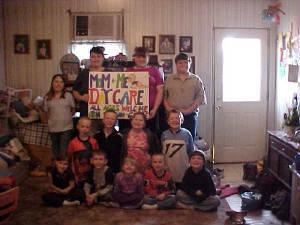 Our second mission for this Daycare is to make everyone feel like a part of our family and welcome in our home. When it comes to my kids, I run a very strict home, but I would rather be a little more strict than the average parent in these troubled times we live in, than to have my kids grow up to be Juvenile Delinquents & a menace to society. Because I have raised my kids in a strict environment, they in turn when helping run the Daycare, do it with that same strictness. Following rules at our house is a MUST! Being a Preacher ~ Teacher of the Bible I sometimes have a tendency to "preach" and lecture when ever I see bad behavior. My home is not only ran by bible teachings but I enforce the TEN COMMANDMENTS and many other verses from the Bible, especially those found in Proverbs. If your child is doing something that conflicts with my Christian beliefs you can expect them to receive a lecture from me about their behavior. My aim is to help them rethink their bad choices and help them to choose better behavior the next time. In doing so, I encourage them to be the best they can be. We promote Healthy Eating and Praying at meal times as well as with and for each other when needed. PLUS ~ We encourage Good Behavior, Laughing, Joking Around with each other, Sharing, Caring, Respecting and Loving one another. The main goal of our second mission is to make everyone who comes into our home feel loved, special and respected. We don't want you or your kids feeling like outsiders, we expect you to feel like family and we welcome you with open and loving arms! THANK YOU for choosing to be a part of our family! God Bless you all & Take Care! 100 Years from now it will not matter what kind of house I lived in, what kind of car I drove or even what my bank account was..... BUT the world may be a better place because I made the difference in the life of a child! 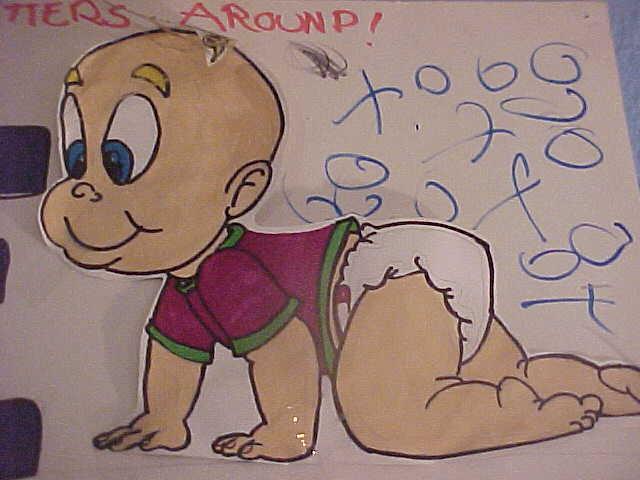 Keep up with what's happening @ MoM & Me DaYCaRe on FACEBOOK!